Pete Odgers has been a workshop teacher for 32 years, and hopes he provides the same inspiration and passion for the subject that he picked up from his school mentor. 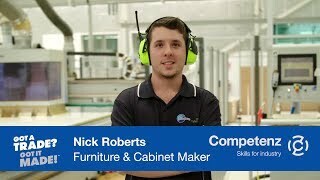 Pete is a firm supporter of apprenticeships and other career paths into New Zealand trades, and can point to many successful tradespeople who’ve been through his Technology and Furniture workshop, and some run their own businesses now. Pete took a long hard look at his own career options in his final year at school. He was born and grew up in South Africa, and at the time the country had a shortage of workshop teachers. Pete took advantage of a government-sponsored ‘study to teach’ scheme. This allowed him to teach woodwork, metalwork, technical drawings and geography while he completed a teaching degree at the University of Port Elizabeth. After a few years gaining experience he completed a B.Ed degree, and his passion has always been for teaching in workshops, especially woodwork. After immigrating to New Zealand 18 years ago, Pete spent 6 years at Blue Mountain College in West Otago, and he’s been at Otago Boys High School in Dunedin for the last 12 years. The most important thing for him is that his students take his subject because they enjoy it. He doesn’t think he’d like teaching a mandatory subject like English or Maths, as he couldn’t be certain whether his students wanted to be there or not. But he knows for sure that his students actively choose to learn the skills, be creative, make things and be constructive. The workshops at Otago Boys’ are modern (and recently had a major overhaul), classes are full, and some amazing projects happen each year. Pete sees this as a clear testament to the fact that both the school and his students see the immediate and long-term value of what his workshop has to offer. His Year 11 students are learning traditional, furniture-crafting skills. There is very limited use of machines in these classes. “It’s all about hand-eye coordination and proper skill development,” says Pete. His Year 12 students have to design and build a piece of furniture to meet the particular specifications of an external client. His Year 13 students have an open brief and can work on any project they choose. Students from the workshop are also involved in the Gateway programme (working one day a week in an industry placement alongside their school studies). Pete ‘inherited’ the Competenz Unit Standard programmes when he arrived at Otago Boys’, but fully appreciates their value. Pete appreciates the support he gets from Competenz, and the fact they have all the Unit Standards he needs for his workshop classes easily available for download from the website. Pete also thinks the Unit Standards give his students a solid foundation to work from. Pete likes the idea that the Units his students do with him create a foundation for their qualifications and apprenticeships, and they can carry on with Competenz as they move into the industries. “Young people can make a successful career going into a trade. And this country is in desperate need of tradespeople,” Pete says. There is no doubt that there’s a steady stream of youngsters still keen to enjoy, learn and be creative in his workshops, so Pete can look forward to a hectic life of full classes and enthusiastic students for years to come, it seems. Peter Odgers is the HOD Technology and Furniture Teacher at Otago Boys High School.